First Line: The rusty iron staircase leading downstairs was narrow and steep. During their investigation into a woman being pushed from a pedestrian bridge onto a busy motorway beneath, police detectives Pia Kirchhoff and Oliver von Bodenstein discover that the victim is the mother of a man who spent ten years in prison for the deaths of two seventeen-year-old girls. The girls vanished without a trace, and Tobias Sartorius was convicted after a trial based solely on circumstantial evidence. Tobias has been released and has returned to his home in the small village of Altenhain, Germany, to find his parents divorced, his father's business ruined, and his father a broken old man. It rapidly becomes clear that the villagers do not want Tobias among them. When another young girl goes missing, Kirchhoff and Bodenstein's investigation turns into a race against time because the people of Altenhain know who's guilty and are more than willing to take matters into their own hands. There are currently six books in the Kirchhoff and Bodenstein series, with this one being the fourth-- and the first to make its way to the U.S. I didn't realize this when I began reading the book, but it was soon evident that the two police inspectors had worked on past cases together. I didn't find this detrimental because none of the past cases had anything to do with their present one. After a few pages I was completely caught up in Neuhaus's story. This author knows how to create a wonderful cast of characters! In this book, Oliver Bodenstein has the lion's share of the spotlight as his personal life begins to take precedence over the investigation, but it is Pia Kirchhoff who caught my attention. It's all due to Pia's feeling that something's not quite right that there's an investigation at all. She begins doing her research and finds things in the old case files that just don't add up. Pia will not let it go when others tell her that Tobias Sartorius was guilty, and she shouldn't waste her time. The two police inspectors are only the tip of the iceberg when it comes to the cast of characters in this book. Neuhaus immediately gives the reader the feeling that Tobias Sartorius is innocent without coming right out and saying so. The author also has one of the best portrayals of what can happen to the family of a man found guilty and sent to prison. There are victims on both sides, and this is seldom shown in crime fiction books. I could go on and on about other characters like the teenage girl Amelie who befriends Thies, a young autistic man. The resident rich man of Altenhain, the television star... Neuhaus populates this book with rich characterizations. But wait-- there's more! The plot has a thread count higher than the best linens at Saks Fifth Avenue-- and each one is carefully woven into Neuhaus's framework. As one element is deduced, six more questions pop up, demanding to be answered. Although this book has a complex plot and many characters (that I had no problem keeping track of), I still felt it could have used a bit more editing and tightening. This is a very small complaint, however. 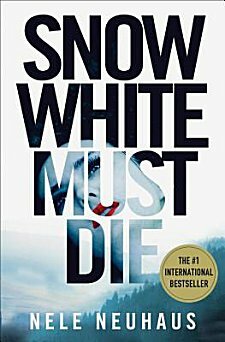 Snow White Must Die is one enjoyable book to read, and I hope you take the opportunity to do so! The only reason I can think of for it to be done is that they choose the book in the series that first "took off," thinking that earlier ones aren't worth publishing here. Who knows? I read all of Nele's books and I don't want to miss one of them. When I went to a benefit reading of Nele and two further authors in her hometown in Germany, I became curious and started reading the books of these 3 authors. Really, I don't regret it and can only recommend: try and read it. I'll read as many of her books as are published in English, Desidura. I really enjoyed this one. Thanks so much for stopping by! Sounds interesting. I've put this on my TBR list. Thanks. You're welcome. I hope you enjoy it, Joe! I really enjoyed this though I wish they hadn't started with the 4th in the series! I think this is a very common pet peeve amongst serial readers!